My esteemed colleague has said much of what I thought about the problems of adapting novels to films, and there are a number of problems with adapting this particular novel to the screen. One is, as discussed, its length; another is the howl of outrage that the fans will greet it with if their favourite scene is cut; the third, and perhaps the most important of all is the peculiar nature of the plot of Goblet of Fire. Without giving too much away, the Triwizard tournament, the setting for the big action set pieces, is a Macguffin of the first water, the whole thing being a set up to get Harry to the right place at the right time. Anyway, just to recap for Muggles and newbies: Harry Potter (Radcliffe) is in his fourth year at Hogwarts School of Witchcraft and Wizardry. The students are thrilled when Professor Dumbledore (Gambon) announces that Hogwarts has had the honour of being chosen to host the interschool tournament, and for the first time we’re introduced to other wizarding schools, Durmstrang and Beauxbatons, and students and teachers from outside Harry’s immediate world, as well as the new Defence Against The Dark Arts teacher, Professor Alastor ‘Mad-Eye’ Moody (Gleeson), who may be evil, or just an alcoholic. Though students under the age of sixteen aren’t meant to enter the competition, somehow Harry is among those picked, and he spends the rest of the year at Hogwarts figuring out why – and how to get a date for the Yule Ball. For hormones, as well as evil, have entered Hogwarts, and the kids are growing up. Mike Newell has sensibly followed Alfonso Cuaron’s lead in keeping the darker and more menacing feel of Prisoner of Azkhaban, and then has fun with the stirrings of adolescent angst. 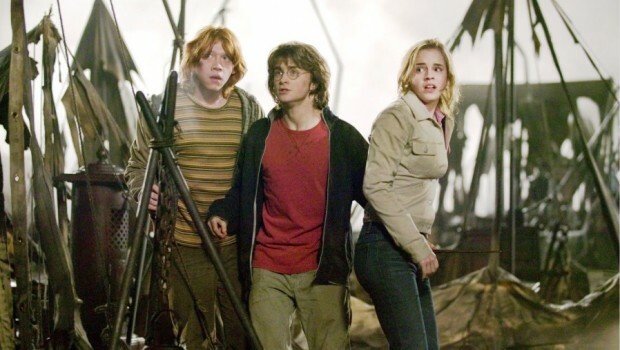 Harry and Ron (Grint) have their first serious quarrel while Hermione (Watson), scrubbing up beautifully, attracts the attentions of Viktor Krum (Stanislav Ianevski), Bulgarian quidditch star and Durmstrang triwizard champion, forcing her useless mates (especially Ron) to see her as a girl and not just their buddy. These were some of the best scenes of the film, where the teenage stars really get to act. The Yule Ball ending with half the girls in tears and the boys in a huff is priceless. New totty in the form of Cho Chang (Katie Leung) and Cedric (Cedric?!) Diggory (Robert Pattinson) are introduced. We also see that the wizarding world is a far less benign place than we have been led to believe, and that the forces of good can also be callous, unthinking, and cruel. Coming back to the acting, the trio have pulled it off again and are increasingly convincing. Emma Watson in particular is excellent as Hermione, no longer giving you that Keira Knightley feeling of dread every time she opens her mouth and another over-enunciated over-elocuted speech emerges, while Rupert Grint gets to flex his acting muscles and provide something more than just the comic relief. Cuaron has also been followed in allowing the kids to spend most of their time out of uniform, dressed in casual jeans and fleeces and with increasingly mad hair (especially Grint, and his older brothers Fred and Ron). The older cast, though given little screen time, are all as marvellous as ever – it’s a shame with so many characters that there’s no time for Gary Oldman (only the briefest of appearances) or even, really, David Tennant as Dark Wizard Barty Crouch. Frances De La Tour is hilarious as Madame Maxime, headmistress of Beauxbatons and object of Hagrid’s (Coltrane) affections, and Miranda Richardon channels Ruth Ellis as predatory reporter Rita Skeeter. Poor Tom Skelton, as former nemesis Draco Malfoy, has only one scene as a bouncing ferret before disappearing for the rest of the film. If there are quibbles, it mainly come back to the structure of the books – they don’t really stand alone – and Goblet is the book where the Dark Lord (Fiennes) returns bringing open war to the wizarding world and leading to the point in Book Seven when Harry, presumably, will make the ultimate sacrifice (incidentally, Harry’s inherent decency is emphasised again here – he is always thinking of others, even at his own expense, as in the second trial). So as part of a series the film is successful, but far less satisfactory – and probably downright confusing – to anyone new to the series or who hasn’t read the books, particularly the ending which is oddly flat. But the lessons of this film aren’t bad ones (loyalty, courage, sacrifice) and it’s enjoyably confident and fun, though not quite up to Azkhaban’s high standards.